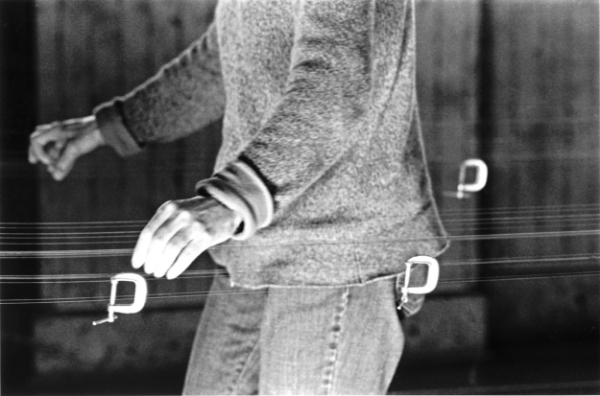 Bay Area-based sound artist Ellen Fullman is in residence here at The Lab through the end of the month. We’ve enjoyed watching and listening as her Long String Instrument develops in-gallery over the last few weeks. Last Sunday, Fullman hosted an afternoon long workshop, “Constructing a Musical Phrase from the Ground Up.” We had a few follow up questions in preparation for her upcoming performances: "Resonance is Harmony" on Saturday, January 23 and "Harbors: Composed Works for the Long String Instrument" on Sunday, January 31. In your talk on Sunday you opened with your Metal Sound Skirt (1980) sculpture, an early sound and performance work from your days in Minneapolis. Currently you are best known for your Long String Instrument. In addition to mobility—the latter's Lab-iteration is 53 feet—what are some differences you experience moving from the public sphere to the exhibition or concert space? I view my performance with the Long String Instrument to also function as a spectacle in the public sphere. Because of its large scale, I am often performing in lobbies, public buildings, churches. In this way I connect with strata of the public that wouldn't choose to go to an experimental music concert. I like this—most people find the installation and the sound to be surprising and fascinating. After your four-person ensemble work of the early 1980s you consciously moved into solo compositions. Can you tell us a bit more about what distinguishes these two practices? I moved to solo performance on my [Long String] instrument for logistical reasons as well as aesthetic. It has been easier to book gigs as a solo artist—bringing other musicians on tour has been turned down by presenters many times. With my solo performance I went deeper into details of technique and articulation. I raised my standards for tone quality to a level that requires a lot of practice. I do have someone interested in putting the time in now and I am hoping to develop apprenticeships in order to share what I have learned. The development of the box bow tool has not only brought a rhythmic element to my music, but it has brought more people into playing my instrument and I am greatly pleased by its accessibility. You mentioned that audiences have a "dampening" effect, particularly with a larger instrument like your Long String. Are there other ways that audience affects your thinking about composition or live performance? Performing for an audience gives me a ticking clock in my mind that keeps me on track to make every moment a new discovery. Nothing in performance can be off the cuff, a toss off. I so want to share the magic of my discoveries with other focused people. We all become witnesses to the unfolding of the beauty of nature—that is when it works! All good performers seem to feel they are a transmitter; music doesn't come from you, it moves through you. Your notation and composition notes—to the untrained, unmusical eye—are dense and lovely. Do you consider them as visual objects on their own? My graphic notation has been carefully designed to convey information as clearly as I can conceive of it. I do feel that the graphic element of my work can stand on its own as a visual object, whether one understands what it is about or not. I have a visual art background; my dad was an artist and worked in advertising. I supported myself as a graphic designer for 15 years—I have the chops. I tell students that the day jobs can come in handy for the art practice! Are there particular composers, albums, or sounds that emerging artists should know about? I am not listening to a lot of music right now because I am too busy making it. I just engineered a recording session for Mills College professor Chris Brown's new piece, "6Primes." The release is TBD. I am so inspired by this composition in just intonation and Chris' performance. I can say it is thrilling. Other things I am compelled by might seem totally unrelated, but I really loved the film documentary Muscle Shoals about the recording studio in Alabama where Aretha Franklin recorded "Respect." I watched 20 Feet From Stardom twice and feel very moved and inspired by it. American popular music that has been influenced by black church gospel music really moves me. What is that intangible soulfulness?